Preheat oven to 400 degrees. 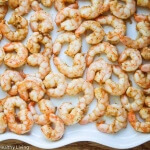 In a large bowl, toss shrimp with olive oil, garlic and Old Bay Seasoning. Transfer to a baking sheet in a single layer. Roast for 10-12 minutes, until shrimp is just cooked through. Set aside to cool. Serve with you favorite cocktail sauce and lemon wedges.